Last week I let you in on the first half of why you should be blogging, how your business benefits from blogging, and a little bit on how you can go about it. This week I round out the series with three very ‘feel good’ reasons to get blogging. Blogs are fantastic ways to find out more about your customers. You can uncover more about their demographic, their needs, or their preferences. Ask questions. Engaging in conversation is a great way for you to reveal your personality, develop relationships and learn. There’s no such thing as a stupid question, you never know who else is thinking the exact same. Ask a series of questions and pose answers or solutions. These solutions can prompt further discussions and learning. Post a number of related topics over a number of posts to discover where your customer interest lies. Posts with more interaction could indicate more interest, allowing you to hone your subject matter. Running a series is a great way to promote a newsletter, RSS, or other subscription service you might have. Never neglect the opportunity to increase your subscriptions (sign up for mine over here and receive a free ebook). Blogs provide fabulous content to share on all of your social media profiles. They don’t just fill a hole, they provide a vehicle to drive content to your website (helpful if your sales are run through your site). When answering questions on a blog, try to incorporate your product, this allows for internal linking (read how it benefits your site), education, and drives sales. By linking to your blog post from social media you can receive numerous benefits. – Meta-description: if you use a meta-description, Facebook will use this in the place of the first 20+ words. As a WordPress User I have installed Yoast SEO, in their program you have the ability to customise the title and description used by a number of social media platforms, including Facebook. This can be useful if you want to undertake split testing or if you prefer not to show your Social Media followers a description filled with SEO keywords. Building relationships is my favourite reason, outside of education, to blog. When I blog I impart a little piece of my own personality. It might be the language I use or my experiences, but there is a little piece of me in every post. I think that doing this is important as it means that when you meet me, you already have a sense of who I am. If I have already shown you a little of myself, then we are on the road to developing a working relationship. I have previously mentioned that many experts believe that it takes five touches before a customer will purchase. Blogging allows businesses to make another touch with a customer. Reaching out to them, where they are keeps you in mind. Even if they are not quite ready to purchase, a post gets you one step closer and can help keep you in front of mind. If you blog to answer customer questions, or you answer their comments on your blog, you are showing them that you are listening. No one likes to be ignored, so listening and responding to customer needs is an important part of building relationships. Why do you blog? What do you enjoy about blogging? Is there something you would like blogged about by Write to Right. Leave a comment below. Businesses will either start with a website and move to social media, or will move in the opposite direction. The next logical step is to move into business blogging. 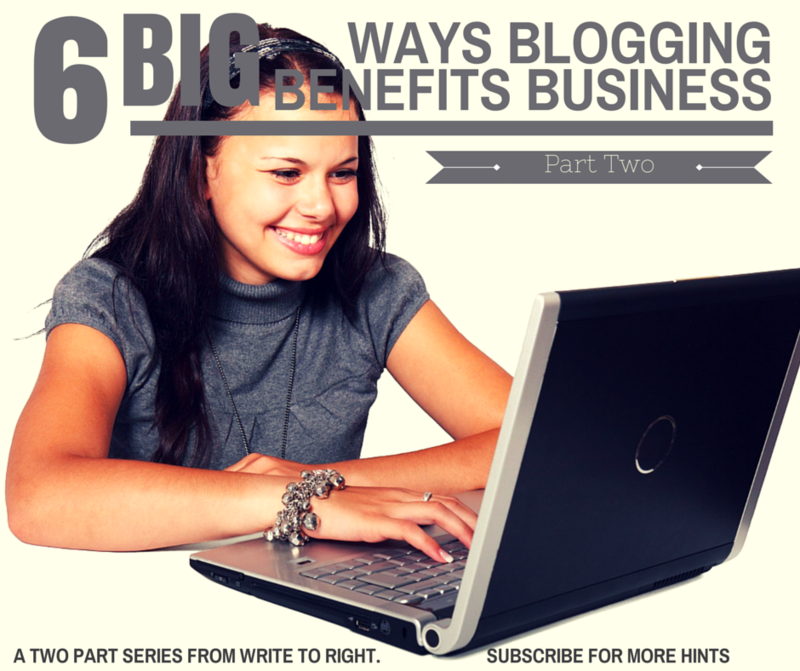 Some businesses start a blog with a clear purpose, others aren’t quite certain. While there are many posts online with content suggestions, I believe that it is equally important to know how your blog can benefit your business. With an overall benefit at front of mind, then businesses are in a stronger position to develop a blog. Here are some of the high-level reasons you should have a blog. 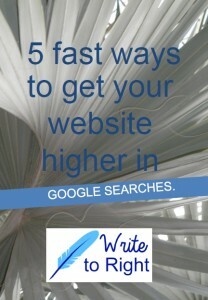 Search Engines will give your website a higher ranking if it is regularly updated. A great way to ensure this is by writing a regular blog post. Don’t worry, you don’t have to write a daily blog – in fact my other business only posts one blog a month and it’s on page 2 of Google (without any paid promotion). Blogs are fantastic vehicles for your SEO keywords. Pepper your blog posts with a variety of one keyword or a smattering of a variety of them. The fantastic thing is that you can test either approach for attracting customers. A word of warning, don’t bog your blog down in keywords; the Google Algorithm is wise to these tactics and will penalise you with a low search result. I previously mentioned how internal links can benefit your site. By linking between blog posts and/or products you drive the search engine deeper into your website, opening up more pages and improved chances to return a positive search result. Blog are a great way to educate your customers. Tell them your favourite ways to use your service or product. Talk to them about the feedback you have received. Let them know what the most popular item is. People love to know that they aren’t alone in using your products and to learn how others benefit; you might just solve a need with something they already own. You can use them to demonstrate functions, benefits, or points of difference. In a competitive environment, points of difference can make a sale. It may just be you sharing little hints, but these are points of difference when others in your marketplace simply sell. With an increase in online sales and increasing imports, service is making a return and customers will often value this more than price. Many customers look for value for money; if you offer an additional service you increase the value of your item. Make sure you remember to put your customer first, don’t make it a massive sales pitch. When writing a blog, ensure you are outlining ‘what’s in it for them’. Many blogs, and books, are written from the industry’s perspective and what will help the person selling the item or service. If your aim is to educate, you need to put your customer first, it’s about what they want to know, know what you need them to know. How will X make things easier, cheaper, more cost effective, or quicker? Time is a big issue for most people, if you can show them a time benefit, you are on a winner. Don’t underestimate the power of getting directly in to your customer’s inbox. I often have a Pavlov like reaction to the ping of a fresh email landing in my inbox, and I can guarantee that I am not alone. People generally scroll through social media, just as they scroll through email. You won’t always have them opening your emails, but if they do you won’t have to compete with sidebar ads and associated distractions. Emails can be flagged for follow up, they can be filed and easily retrieved, and emails offer the opportunity to personalise. Emails offer the opportunity of a back-up plan. They give you a way to distribute information if social media falls or your website crashes. You can inform them of outages, changes, and promotions (who doesn’t love a sale alert by email). Email lists allow you to target customers who WANT to receive your information. They openly agreed to receiving your message, so they are open to it. They have given you a little personal detail; they have opened a door into their private world and invited you in. It’s a more personal connection, which helps you to build a more direct relationship. It’s these relationships which lead to sales. By asking customers to subscribe, by email, to your blog you open up a direct line of communication. Email lists are a powerful, direct marketing tool which your customer opens up to you. (tweet it) Don’t waste it and don’t overlook the power of adding it to your marketing strategy. 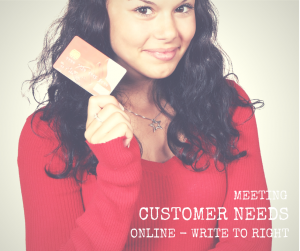 Write to Right also provides proofreading and editing for blog posts. Please consider our services as part of your ongoing web profile. Our proofreading schedule is available on the site. Blogging is just one way to improve your search engine ranking, find out other ways to get your website to page one on Google by filling in the following form. Research just out of the US indicates that Facebook users are being turned off by hard sell in their Newsfeed. In fact, 95% of people say that social media has little to no effect on their buying behaviour. 94% say they use social media to catch up on what friends and family are up to. Only 29% say they use social media to follow trends or find product reviews. I think these statistics go some way to explaining why businesses have seen a decrease in direct sales on Facebook. Now I know that we all have different audiences, and this research is broad, but I still believe that as social beings on social media, businesses can benefit from being social. (And this is what is recommended in the report) Now that DOES NOT mean not selling in your posts, it means not being SALES-Y. The research recommends engaging Millenials, I believe you need to engage your ideal customer. If you have gone through your audience on your Facebook page, you will know the gender, age group, and location of the majority of your customers. If you are targeting your ideal customer, they should fall into this main group of Facebook likers. Use this data to drive your interactions. Imagine your ideal customer’s needs, problems, daily lives, or ask questions; then use this to develop content for them. Did you notice the last part of the last sentence? “develop content for them” The key is that you need to write for your customer. You need to meet their needs, solve their problems. A list of features is nice, but it’s then up to me to work out if and how they will meet my needs. Not sure what I mean by listing a benefit rather than a feature? In general, the benefit will contain verbs (help, stop, prevent, reduce) and the features will contain adjectives (bright, short, long, versatile). Don’t stress about making it a shopping list of benefits. I would aim for between three and five benefits (people retain between five and nine facts) per post. I like three. Why? I have a quirk about the number three, time is short (and three is small), and I was taught to present data in groups of three when trying to convince an audience. There is an added benefit to selling benefits; by doing so you are letting your customers know that you listen to their needs, you are interested, and you understand. By showing your customers that you are listening, you allow a relationship to develop and facilitate conversations (and then conversions). I mentioned at the start that 95% of Facebook users are there for socialising. If you can bring a social aspect to your page, and particularly sales posts, you are meeting your customer’s need to socialise. Some customers are there to research, by answering customer questions on Facebook you will either answer their question and/or demonstrate that you are listening to your customers. I have previously mentioned the belief that it takes five touches before you make a sale. Being sociable will assist in making these touches and move your business closer to a sale. Here’s an insight, all of these tips are equally applicable to your website. You can use them in your blog, just as I have here, or better still in your product descriptions. Your website is your way of reaching customers where they are, when they need your service/product; give it the best chance of meeting their needs. Write to Right offers website checks to ensure that your site is in the best possible shape, meeting both your client’s and your business’ needs. Find out more about this quality service on the website. Alternatively, skip the queue and book your site in to gain an early advantage.